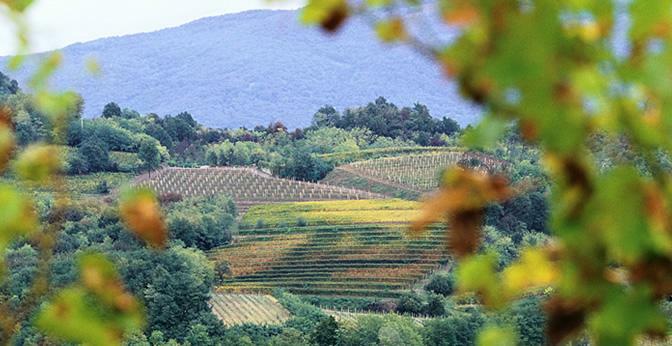 The world-famous Attems wines are grown in Italy's renowned Collio DOC in the northeastern part of the country, bordered by the Alps to the north and the Adriatic Sea to the south. This geography creates a temperate microclimate, and the region's marl and sandstone soils make it perfect for Pinot Grigio and Sauvignon Blanc, as well as for the native Ribolla Gialla and Tocai Friulano that have been harvested here since at least as early as the 18th century. The Attems family winemaking lineage dates back nearly a millennium. In 1106, records show that the Bishop of Salisbury gave them the estate for the purpose of cultivating vineyards and making wine. After 900 years of wine production, Attems aligned with the renowned Marchesi de' Frescobaldi, one of Italy's most revered wine families. Douglas Attems and the Frescobaldi family celebrate a legacy of friendship founded during their years as students at the University of Florence. The partnership understands that a wine's quality and personality reflect the land it comes from, and they have pledged to further enhance the vines at Collio. Together they have committed to innovative vineyard development and to strategic participation in the global market. James Suckling 90 Some yellow and green apple notes as well as hints of flint. Light to medium body, fresh acidity and a green-apple finish. Vintage report After a mild winter with little rainfall, Spring followed in similar fashion with slightly higher than seasonal average temperatures.
" This Pinot Grigio appears a rich straw yellow with shimmering, coppery highlights. Ripe tropical fruit, along with apple and pear, create a rich, generous bouquet, while the palate is refined, smooth, and pleasantly tangy. The finish seems near endless, showcasing abundant, crisp-edged fruit." This Pinot Grigio appears a rich straw yellow with shimmering, coppery highlights. Ripe tropical fruit, along with apple and pear, create a rich, generous bouquet, while the palate is refined, smooth, and pleasantly tangy. The finish seems near endless, showcasing abundant, crisp-edged fruit." "This Pinot Grigio appears a rich straw yellow with shimmering, coppery highlights. Ripe tropical fruit, along with apple and pear, create a rich, generous bouquet, while the palate is refined, smooth, and pleasantly tangy. The finish seems near endless, showcasing abundant, crisp-edged fruit."